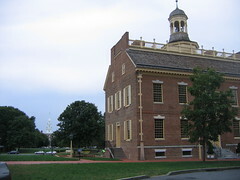 Unlike many of our state capital tours, in Delaware we toured the historic (read: “old”) State House building that served as the first capitol building. It stands on a picturesque green in Dover. As we opened the large doors at the front of the building, we were greeted by a guide who looked like he hadn’t given enough tours that day. Therefore, we were treated to the most thorough tour imaginable! Of course, in a state as small as Delaware, the legislative chambers are quite small. Everything is restored to its original 18th century appearance. An imposing picture of George Washington hangs in the senate hall and seems too big for the room. . . it was actually tough to get a good picture of it. The main room was the judicial room and Kristy and I got to take turns sitting on the “defendants bench.” The lawyers and jury were one level above and the judge must have seemed very imposing sitting two levels above the accused. The bench was flanked by two spear-shaped poles painted white on one side and red on the other. Historically, if the defendant was found guilty, the red side would be turned out and if innocent, the white side would be turned out in order to notify all those gathered with a visual cue. Naturally, this provided some great photo ops for the Roadchix. 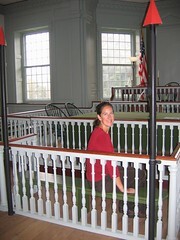 The Old State House is just one of a collection of museums in the Dover area, so it would be good to focus a whole day on Dover if possible. From the World's Doctor's Bag to Nipper the RCA Dog, it's all in here. See what we thought the must-see, cannot miss attraction of Delaware is. Get your t-shirts, mugs, license plate covers and bumper stickers for all your roadtrip needs.